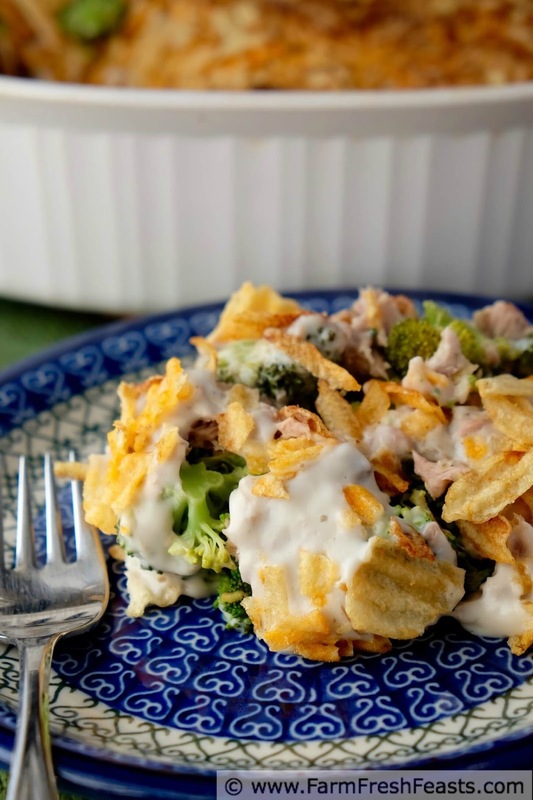 Full of broccoli and tuna, with a creamy sauce and the crunch of potato chips, this noodle-less tuna casserole is a family-friendly 5 ingredient dinner ready in under 30 minutes. This is the tuna casserole of my youth. Other folks grew up on Tuna Noodle. Not us. My mom left the pasta for other dishes and fed us this simple 5 ingredient dinner. 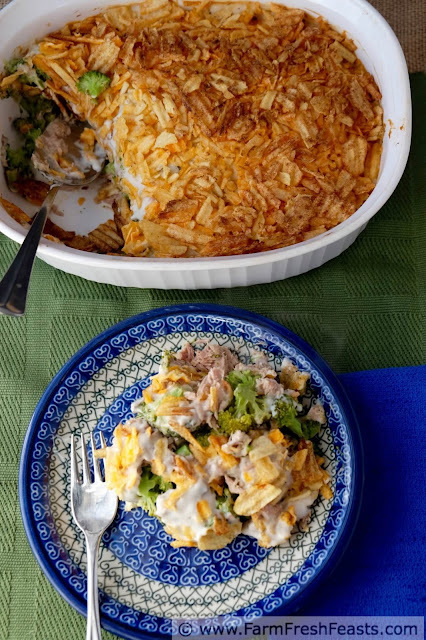 After years of fixing my spouse's favorite Tuna Noodle Casserole, from his mom's recipe, I realized how much I missed the one I grew up with--so I made it for my kids. It's important not to lose sight of your childhood favorites when you join your life with someone else. I'm using locally grown broccoli from my Community Supported Agriculture (CSA) farm share in my version. 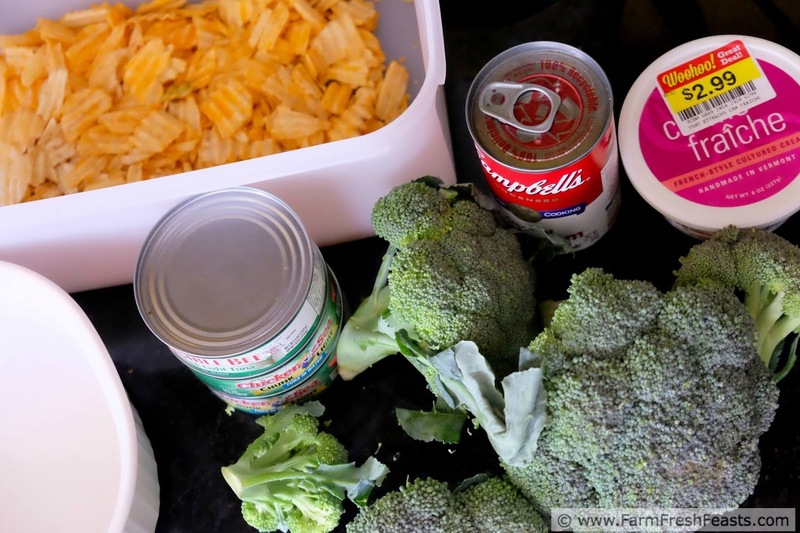 Growing up, mom always used boxes of broccoli spears and arranged them across the bottom of the dish with the 'tree tops' to the outside of the dish and the 'tree trunks' in a line down the middle of a 9x13 inch pan. 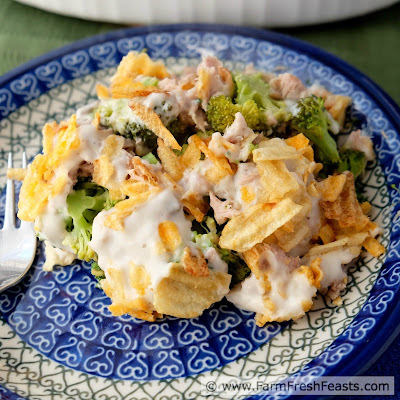 The combination of tuna, broccoli, creamy sauce and crunchy chips is an addictive one--and a terrific way to use up those chips at the bottom of the bag. If you've got bigger chips, I recommend making up a batch of Spiced Cottage Cheese Chip Dip and making quick work of those. I'll help. This casserole is fairly dry when you first serve it. That means it just begs to be smushed around on your plate. I fixed this for lunch one day and my daughter had a rare second helping, then the kids fought over the leftovers. 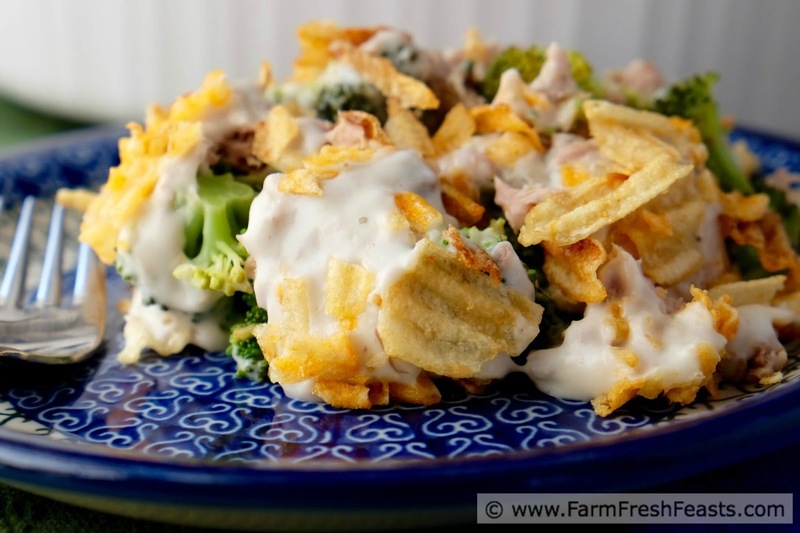 For more recipes using broccoli, please see my Broccoli Recipes Collection. It's part of the Visual Recipe Index by Ingredient, a resource for folks like me poking in the farm share box and wondering what to do with all the vegetables that have appeared all at once in my home. 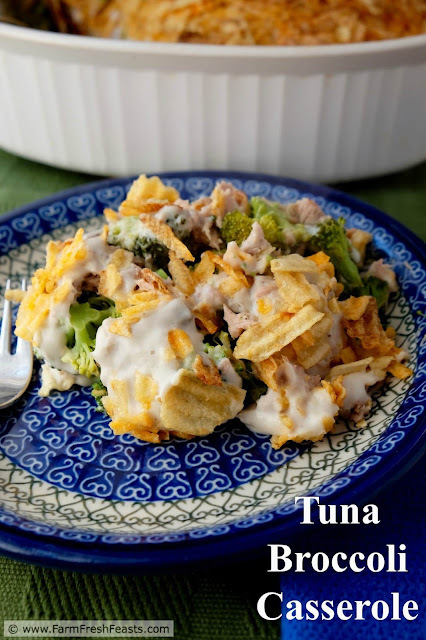 I'm pinning more casserole recipes to my Pinterest boards, follow me there to check them out. I'm sharing recipes and articles that catch my eye on my FB page, follow me there. And for what's up in the kitchen or with the dogs, check out my Instagram feed. Want to know How To Use This Blog? Place rinsed broccoli in a casserole dish (I'm using an oval 2.5 quart (Amazon affiliate link) but a 9x13 pan would do fine). Microwave for 3 minutes until barely tender. 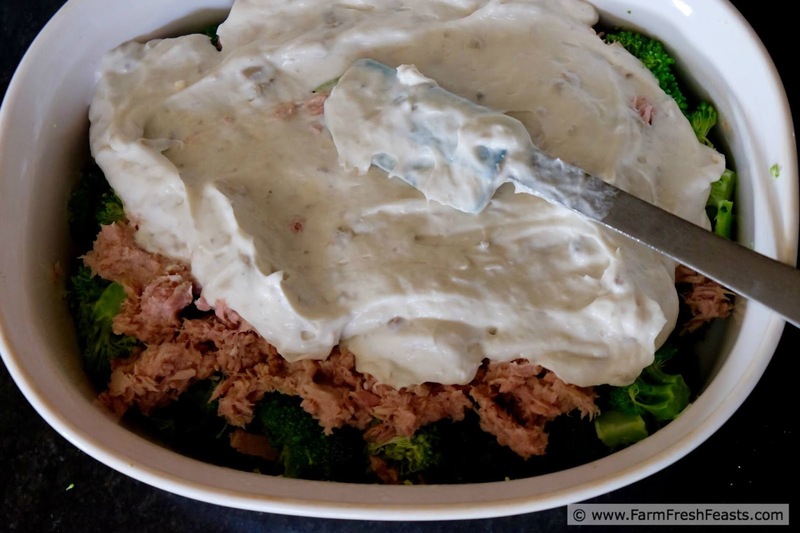 Drain tuna if necessary (my dogs love Tuna Juice on their food) and layer over broccoli. In a small bowl, combine soup and crème fraîche. Spread on top of tuna. Cover with potato chips. Bake for 20 minutes. Serve with salt and pepper at the table. Leftovers reheat well though you may wish to add more potato chips on top for crunch. And now I want chips. Good thing the Hubby is on the way to the store and I can have him pick me up a bag. Broccoli with cheese sauce will always be a part of my youth. Along with Friday night pizza and Sunday morning donuts. Thank goodness for modern technology to send word to someone making a grocery store run. That mental telepathy thing never worked for me. And now I want donuts. Your work here is done. Wow! My mother used to make this casserole but a little differently. I was like you in that others made theirs with noodles but not us. She used frozen broccoli instead of fresh because it was what we could afford. She never used that crème fraîche stuff. There was something else in there but I've never been able to remember what it was. It wasn't crème fraîche though. It was one of my favorite dishes. I miss my mom so much. Thanks for sharing your version.